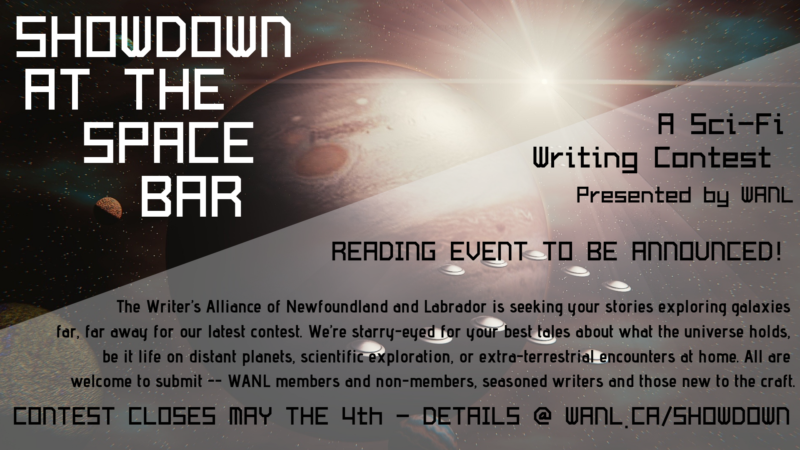 WANL’s Showdown at the Space Bar invites you to submit your polished sci-fi flash fiction of 750 words or less. Entrants’ work will be evaluated by a team of three judges, who will select a top five. These will be announced at an event (date and location TBA), where the selected writers will read their stories and the audience will vote to determine the top three! The winner and two runners-up will receive some out-of-this-world prizes from Geeks Public House, St. John’s Soap Works, Midnight Tailor’s, Kyle Callahan Photography, Corkboard Pens, Sweet Loots, and more. Keep tabs on our Facebook page for updates on prizes and other contest news. Entrants must be residents of Newfoundland and Labrador. Submissions are blind judged, so ensure your name doesn’t appear anywhere on your work. The 750-word limit will be strictly enforced. Stories exceeding this limit will be disqualified. If you can’t be there on voting night and it turns out you make it to the top five, no sweat! We’ll find a reader for you.